"...And the game was over and the player woke up from the dream. And the player began a new dream. And the player dreamed again, dreamed better." 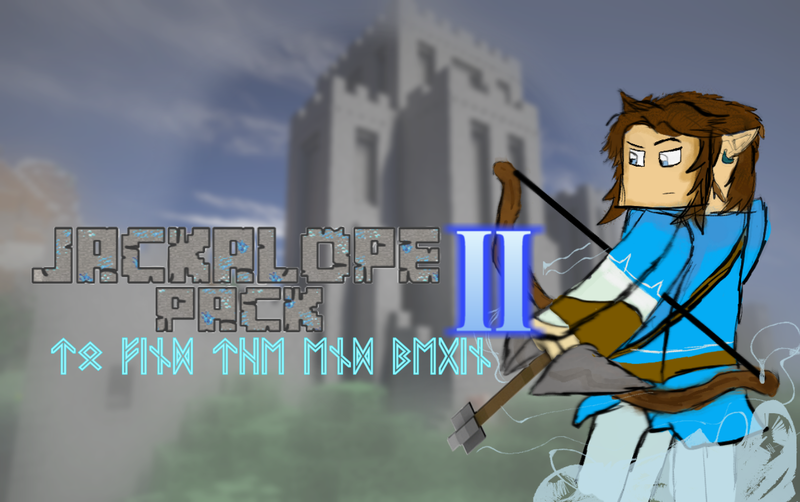 JackalopePack II is a modpack that aims to fix what Minecraft updates 1.8+ got wrong, create an immersive world of questing and NPCs, and finish what Markus Persson started in 2010. This modpack contains some of the best Minecraft mods ever created but, at its core, is powered by "JackalopeCore" : a mod that brings all the mods together and adds in a ton of custom content. -The Legend of Zelda by Shigeru Miyamoto and Nintendo Corp.
-The Elder Scrolls by Christopher Weaver and Bethesda Corp.
-Overwatch by Jeff Kaplan and Blizzard Corp.
-Minecraft 1.0-1.7 by Markus Persson and Mojang Corp.
Update notes and everything pertaining to JackalopePack will be posted on this thread from now on. Then spread the freakin' word, confound it! ►Adding a combo attack system versus armor. Essentially, armor now takes skill to use. If a player with armor is hit over three times in a row without hitting the attacker back, the wearer begins to take increased damage for each consecutive hit. Inexperienced players with OP tank armor can no longer absorb scores of damage without a single consequence. The LOTR Mod's (one of the mods in JackalopePack II) Combat system is pretty awesome! Mevans did a great job! However, the weapon stats only apply to LOTR mod weapons. Now, in the Framework Update, that is all changed. Weapons from other mods and JackalopePack II's custom content now have their own stats that are changeable within a config file found in the .minecraft folder. As negative as the title sounds, adding this ability will actually add both a simplicity and a skill factor to Minecraft's combat. In essence, with the LOTR Mod's combat timer, players can no longer spam click (yay!) and instead can hold down the mouse button while attacking to strike repeatedly. Remember when 1.9 added in a sword sweep attack that could be accomplished by holding shift while attacking? Well, this is that, but better. Now, the player can utilize one of two alternate attacks when "shift-clicking". Swords and spears will perform a stabbing attack that penetrates armor (but with a -30% damage penalty and +60% combat timer penalty) allowing the user to damage players and armored NPCs directly. All other melee weapons on the other hand do a sweep attack which deals widespread damage (but again with a -30% damage penalty and a +60% combat timer penalty) and +1 knockback. Just like 1.9, idle players can be pushed around by mobs and players. ►Adding a Half-Life 2 Engine-style "Crouch-Jump"
Holding shift, while in the air, no longer inhibits movement. It also allows skilled players to jump over obstacles that are a block and a slab high. Cloned CustomNPCs now have the ability to naturally spawn in any world (with the right settings). Jackalope will be creating tons of unique characters and villager NPCs that spawn in custom villages and kingdoms. CustomNPCs can also now be interacted with in the same way that the player can interact with MCA villagers. That's right. You can now befriend NPCs, go questing with them, and even raise a family with Custom NPCs. And there you have it : The Framework Update! We don't have a time estimate quite yet, but as soon as we do, a post will be made in further detail.